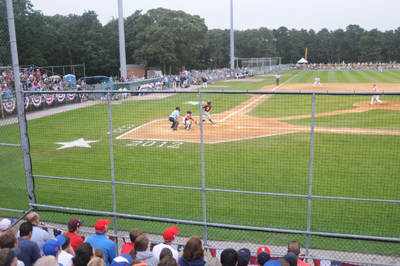 Despite threatening clouds and wind, the crowds turned out in droves for the Cape Cod Baseball League’s 2012 All-Star Game on Saturday, July 28, with a packed house of 3,812 fans at Whitehouse Field in Harwich. The East and West ended the game in a 1-1 draw, with Robert Pehl (Washington, YD) singling in Alex Blandino (Stanford, YD) in the ninth inning with two outs. 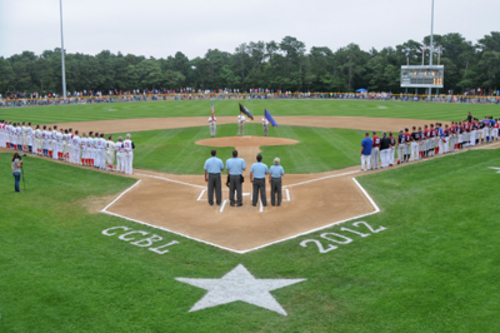 It was the first All-Star game held on Cape Cod since 2008, as for the past three years the game had been hosted by the Boston Red Sox at Fenway Park. The 2012 game was the 25th competition between the East and West divisions since the East-West format was adopted in 1988. 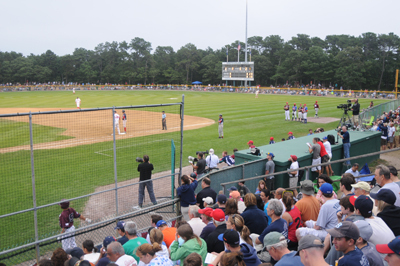 The game itself was uneventful in its start with the East’s starting pitcher from Yarmouth-Dennis, Aaron Blair (Marshall), as well as the West’s Sean Manaea (Indiana State) from Hyannis, who entered the game leading the league with 66 strikeouts, threw a combined scoreless first inning. The trend continued as Orleans’s Matt Boyd (Oregon State) pitched the top of the second without giving up any hits and Konnor Wade (Arizona) from Wareham held the East off in the bottom half of the inning. With two outs in the top of the third, Wareham’s Daniel Palka (Georgia Tech) hit a double but was stranded on base, as Orleans’s Pat Christensen (La Salle) gave up two hits in his outing. Hyannis’s David Garner (Michigan State) closed out the inning for the West by only giving up one hit. The highlights of the game continued to come mainly from the performances on the pitcher’s mound, as Harwich’s David Whitehead (Elon), Orleans’s Kyle Crockett (Virginia) and Y-D’s Brian Verbitsky (Hofstra U) pitched consecutive scoreless innings for the East. On the West side, Falmouth’s Trey Masek (Texas Tech), Hyannis’s Jeff Hoffman (East Carolina), Bourne’s Timothy Giel (Columbia) and Nick Rumbelow (LSU) from Wareham also combined for a total of seven scoreless innings. The game remained scoreless until the top of the eighth when the West struck first on a dropped third strike with two outs. Bourne’s John Murphy (Sacred Heart) advanced to first base on the play and Cotuit’s Jacob May (Coastal Carolina) scored the game’s first run. Chatham’s Ryan Thompson (Franklin Pierce) escaped the inning after giving up the sole run, and the score remained 1-0 until the bottom of the ninth, when Y-D’s Pehl hit an RBI single with two outs, knocking in teammate Blandino for the tying run. The final score was West 1, East 1 and Wareham’s Palka took home the award for the West Division’s MVP, while Y-D’s Blandino was the MVP of the East. The Home Run Contest, which was held prior to the game’s start, was won by Harwich’s Jacoby Jones (LSU).